The truth is stranger than fiction . . . 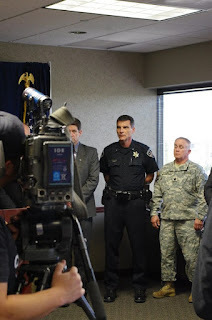 So the Idaho National Guard was involved in a domestic "policing" activity, eh? That explains the camoed goon to the right. Another invader seized Farrar’s shrieking two-year-old son from his crib and refused to allow his parents to comfort him. All the forces of Earth, Heaven, and Hell would not prevent me from tracking down every last one of the criminal scumbags responsible for such an act and meting out my own brand of justice to them. Excellent and troubling read, Mr Grigg. And these d-bags still have the gumption to call themselves "public servants." One stern warning from the IRS or the DA would have sufficed. and bring him/her down for say $1 million? $5 million? $10 million? $n million? It's not about the money, right? It's the principle, at any price, yes? No gov't sting is possible or needed. It's not possible because the "lamestream media" would not cooperate. It's not needed because we know they are hypocrites. The solution is to stop funding the violence with money and respect. The respect is shown as a moral blank check. The public does not judge the gov't workers by the same standards as citizens. It grants them immunity from moral judgements. Whatever they do is automatically assumed to be legal and justified "for the common good", without defining that term. We are the problem. We created the system that concentrates control and moral authority without accountability. As long as we allow it, injustice will reign. Do not look to blame the gov't you created and support. Examine the concept of giving an elite a monopoly on force and morality. Do you deserve to be ruled? Does anyone? Are you capable of self-government? Are you sovereign or not? If not, how can you be empowered to choose your rulers (elected officials)? Do we make ourselves "underlings" by giving away our power of self determination to others? Isn't it time we took back our lives? Our freedom? JUST SAY "NO!" TO GOVERNMENT. NO! YOU CAN'T RULE US. WE ARE SOVEREIGN, NOT YOU. You use the word "you" quite indiscriminately; I withdrew my consent years ago. However in the interest of being around to raise my children, I continue to pay my protection money--aka "taxes". I didn't create, nor do I support, this criminal regime. And--in an example such as this raid--my lack of consent would be quite obvious. Bluntly so. How have you enforced your sovereignty, voluntaryist? Wow! 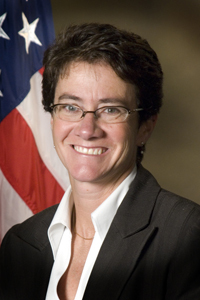 This gender confused federal prosecutor is certainly running amok. The "law" has been hijacked by the government. It is now something you obey and they dictate, the government no longer being bound by it. I believe they call these things police states. Anyways, they don't really believe all their nonsense about the dangers of the latest substance to fear, it all comes down to how much loot they can haul in on their latest raiding party. It hit me once more, not that it should have been any surprise, that it would have been best for Mr. Hill to have simply kept quiet. I'm sure hindsight being 20/20 he's had time to mull that over. His robotic statement read like a "confession" from a Communist show trial after having sent the ursine symbol of the revolution off into the void. No good deed goes unpunished when Janet Reno's successor is on the prowl seeking whom it may devour. I'd keep a wary eye out for that one. I was about to ask where the governor is in all of this but i think i know the answer. what really gets me is the pervasive belief that the US Code is somehow applicable everywhere...even overseas. Is Wendy Olson a man or a woman? Outside of the name, I'm having a tough time telling from his/her picture. Is this what "diversity" brings us? Sapiens: The pronoun "you" refers to all collectivist/statists in the sentence "... the gov't you created and support." That could be inferred from the context. If you thought it incorrectly referred to you, why would you? Are you doing all you can to resist the state? I quit my first job in 1954 at age 12 and started a business to avoid the deductions (theft) taken from my check. You claim to be paying taxes to stay out of jail so you can raise your children. Only you know if this is the best way for your situation. But from your objection to my use of "you" I sense a guilty conscience. Ask your children how they view your tax paying. Do they know you pay "under protest"? Do they know you hate the state? Do they know why? This would be important feedback that tells you if you are countering the message of the state. I was open and vocal about my tax resistance in the seventies. All my friends and associates had no doubt I would go to jail. Most of the other tax protesters I knew did just that. I saw first hand many examples of illegal, unjust prosecutions. I was targeted. I took evasive action and escaped. I learned that direct confrontation is futile and went underground where I have lived as freely as possible, under the shadow of the growing police state. It should be obvious to anyone who is not a state apologist that we who are not part of the ruling elite are all in danger. The law is not for our protection. The law creates the illusion of justice and promotes obedience to the myth that gov't is necessary. an equal exchange of goods and services, i.e., labor for money. that wages are not income. justify stealing money from our wages. that generates no income whatsoever. calling it such would be an absurdity and an obvious fiction. Again, I am surprised to see the SCOTUS agreeing to hear this case. Reminds me of the USSR where all they had to do is watch you until some law was broken. Doesn't the report any sales over 10,000$ come out of the RICO act? Willb: Yes, the SCOTUS does like to dodge their duty. But when they do take a case that might limit gov't they will side with gov't, city, county, state, or federal. Take the New London case. They expanded eminent domain from taking for public use to taking for private use if a higher tax revenue "might be" realized. They equated more revenue for gov't with a "common good". Following this argument to its logical conclusion, if taxation were to reach 100%, the maximum common good could be achieved. Should we all surrender all our wealth "for the common good"? Would we all be better off? The SCOTUS believes so. This is typical of the gov't mindset. It was thought to be an indefensible statement when a king declared: "The state? I am the state!" Now we have the gov't declaring: "The common good? Whatever benefits the gov't is the common good." And so we are all expected to serve the gov't, reversing the principle of gov't as servant of the people as expressed in the D. of I. ". . . dodge their duty." Typically this dodge is accomplished by not hearing a case. Regardless of your motives for paying income taxes, the fact that you do means you DO endorse the system. It's as simple as that. I, too, saw the writing on the wall, and took evasive action. I chose to to suffer whatever sacrifice was required of me to not be a hypocrite and endorse a system I could see was evil to its core. Though I have no family to raise, I know several families with children (often a LOT of children) who did the same. You continue to pay because you fear the discomfort and risk of not doing so, but you still pay. Do you think the Beast doesn't know this? That's why man-made governments use force and fraud to bend you to their will. It works. When it stops working it's because enough unneutered males decided that their family would be better off fatherless in a free land than lovingly fathered in chains. It stops when enough females look outside the 4 walls of their homes and come to the same conclusion. On the same note, it never ceases to amaze me when people who complain of government enslavement still proudly send their boys to war for that very government! What the . . . ? So, it's okay for fathers to die trying to establish hegemony abroad but not for liberty at home?